The best (and worst) part of moving is discovering exactly how much stuff you have. It is exciting to find things believed to have been lost and frustrating to discover how many little plastic junk toys have infiltrated the house. Unpacking and rearranging the books is my favorite part. 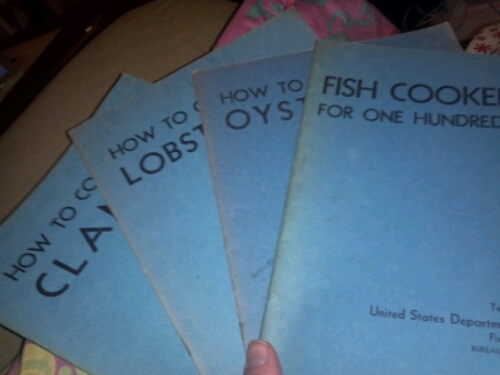 These blue booklets are part of a series put out by the Fish and Wildlife Service Bureau of Commercial Fisheries. I found them at a Goodwill Outlet where they sold items by the pound. I love the shrimp cocktail recipe that calls for an entire cup of horse radish and the crab cakes for 100 that begin with a pound and a half of butter. It all sounds delicious. What joys will be in the next box?